The canary yellow Royal Enfield in the picture below is owned by Gregory David Roberts. Do you know who he is? I met him in a café in Mumbai. Leopold’s to be precise. As an aside, Leopold’s, founded in 1871, has long been a landmark in the central Mumbai district of Colaba. It was January 2007. Meeting Roberts was all a bit accidental. I just happened to wander into Leopold’s for an afternoon beer after a visit to Elephant Island. My attention was caught by a tall, thin, European-looking man, with long hair tied in a bunch behind his head, seemingly signing books for waiting purchasers. His table was surrounded by boxes of, again presumably, his books. I stopped a young woman who had just purchased a book and asked who he was. She explained he was an Australian who had been a criminal, who had a series of adventures in India, and who had subsequently written a book about his experiences and adventures. His name was Gregory David Roberts, but was better know by his Indian nickname, Shantaram. Initially, I didn’t think much of it, but thought that I might regret it if I did not get an autographed book from him. No rational reason here; just an instinct. I introduced myself. We talked about India a little and I told him about the venture I was about to embark on, travelling around Rajasthan on a Royal Enfield. 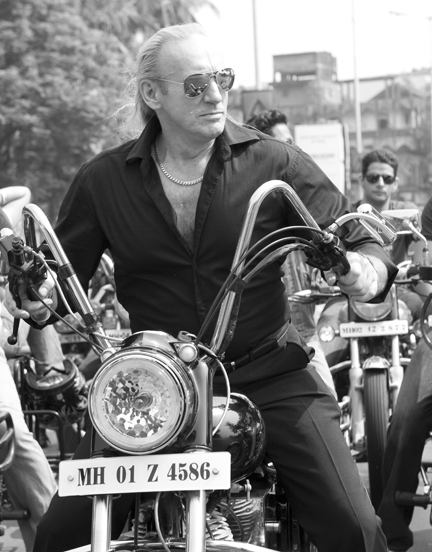 He invited me to come out front and view his Royal Enfield. The author, Gregory David Roberts, started his Shantaram story with his life as an armed bank robber in Australia. He was imprisoned at Pentridge but escaped and got to NZ on a forged passport with the help of his former BLF mates. He ended up in Bombay and got involved with the local mafia. His story includes life in a Bombay slum, becoming the resident ‘medical centre’, smuggling whatever was profitable, racketeering, fighting for the Mujahadin in Afghanistan, spending time in an unbelievably atrocious Bombay prison, travelling to Europe, being captured and arrested by Interpol, being returned to Australia to complete his prison term, and later returning to India. He has since become a latter day writer, philosopher, mentor and philanthropist. His story is absorbing and well worth a read. You can find more about him at Shantaram.